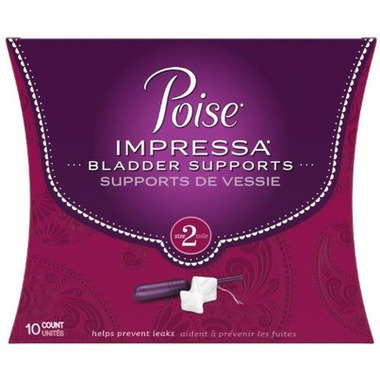 Designed for the temporary management of Stress Urinary Incontinence (SUI) in women, Poise Impressa Bladder Supports are a revolutionary new non-absorbent, removable internal product that help stop bladder leaks before they happen. If you leak when you laugh, cough, sneeze, or dance, Impressa Bladder Supports are for you! Safe, effective and easy to use, Impressa is available in different sizes to adapt to your unique internal shape. Non-absorbent, internal product designed to help stop Stress Urinary Incontinence bladder leaks for up to 8 hours. Health Canada cleared and gynecologist tested. Bladder supports are an alternative product to incontinence liners and incontinence pads. 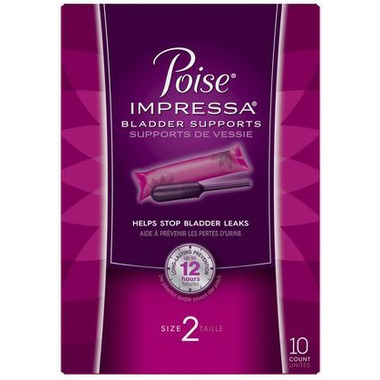 Poise Impressa are soft, flexible and disposable. Please note: There is the possibility of receiving either of the packages shown above. Rest assured, the product inside is the same.